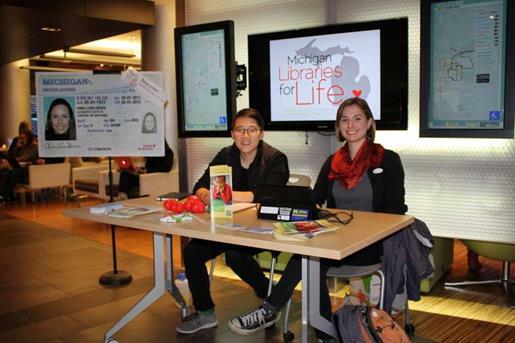 [Michlib-l] FW: Join Michigan Libraries for Life 2016! Subject: Join Michigan Libraries for Life 2016! Join Michigan Libraries for Life 2016! If you could save a life, would you? Most people would say “Yes!” without hesitation. One of the simplest ways to save and improve lives is by supporting organ, tissue, and eye donation. Since 2010, libraries across Michigan have participated in a simple and effective campaign to educate patrons about donation and transplantation, and to give them an opportunity to join the Michigan Organ Donor Registry<http://bit.ly/ML4Life>. The campaign is called Michigan Libraries for Life<http://www.librariesforlife.org/>. This statewide campaign, which includes public, academic, special and hospital libraries of all sizes, has inspired nearly 2,900 people to sign up as donors! More than 95% of Americans<http://organdonor.gov/dtcp/nationalsurveyorgandonation.pdf> support organ, tissue and eye donation. Yet in Michigan, only 54% of adults have joined the state’s donor registry. That discrepancy is largely due to residents not knowing how to properly join the donor registry. Michigan Libraries for Life helps to address that information need. We are excited to bring this lifesaving event back in 2016! Libraries are welcome to participate by staffing a registration table in their libraries for however long they are able, from just a few hours to all 7 days. This year’s drive will start on Monday, October 3rd and run through Sunday, October 9th. Gift of Life Michigan<http://giftoflifemichigan.org/> will provide a free in-person training for library representatives at the Redford Township District Library on Wednesday, August 17th and a session at their Ann Arbor office on Friday, August 19th. We have also developed web-based training materials for those who are unable to attend the in-person sessions. The key to this program's success is the participation of many libraries across the state. Your library is warmly invited to join the 2016 Michigan Libraries for Life organ donor registration drive. If your organization would like to participate in this year’s program, please complete this registration form: http://bit.ly/ML4L2016. If you would like more information, please contact us at MichLib4Life at umich.edu<mailto:MichLib4Life at umich.edu> or (734) 936-1394<tel:%28734%29%20936-1394>. The 2014-2016 Michigan Libraries for Life program is generously funded by a Community Grant from the Gift of Life Foundation.